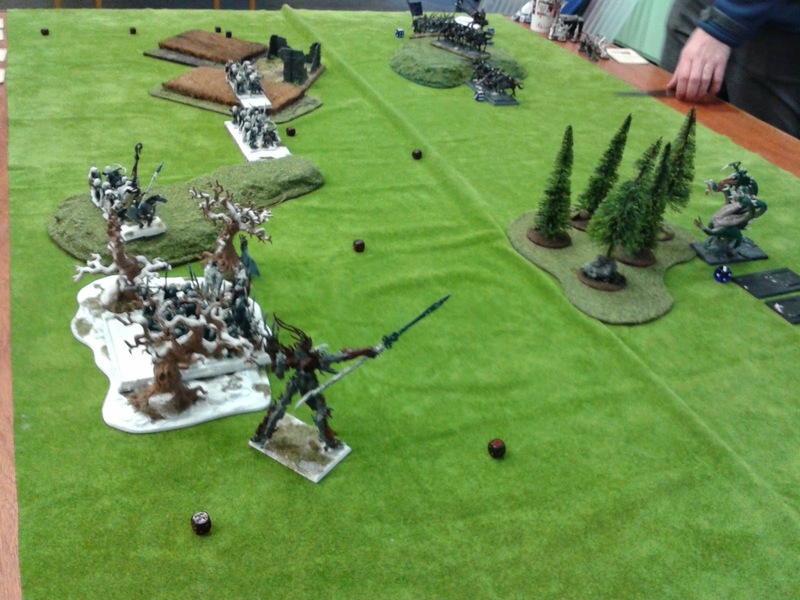 In short it was a Storm of Arrows Vs a Horde of Beasts. 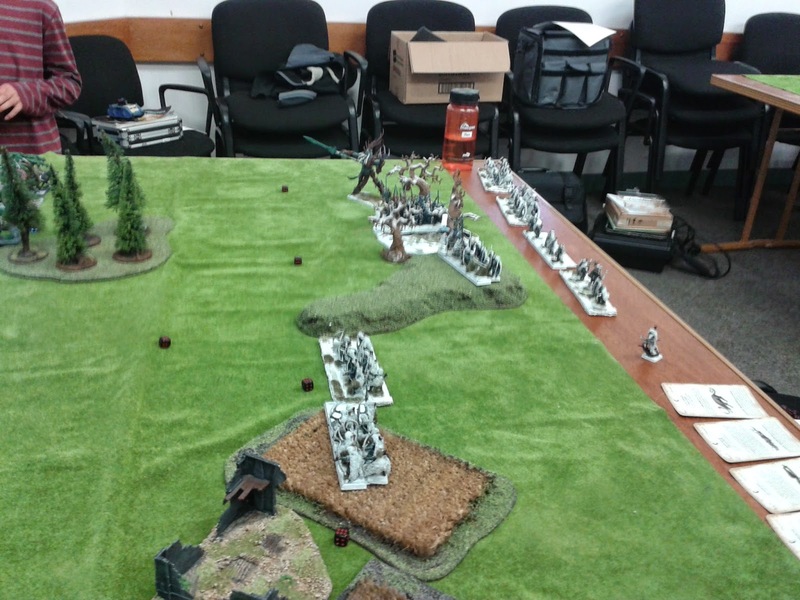 We decided to roll for the scenario and we got Blood and Glory, and we both had 5 fortitude. 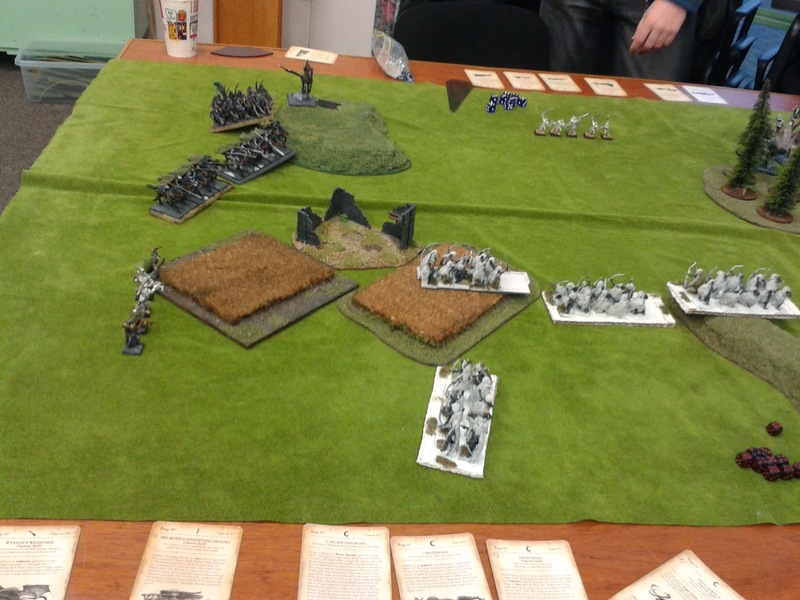 We rolled for sides and proceeded to set up our forces. 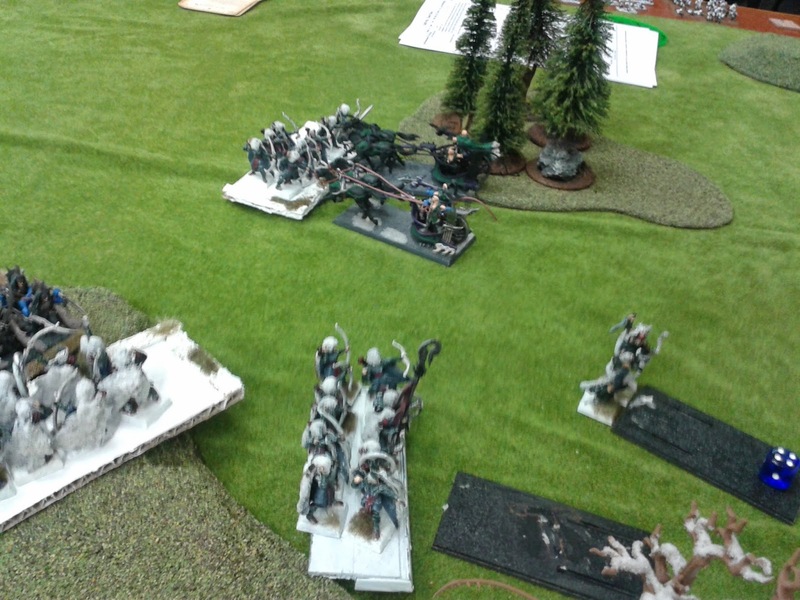 Now i screwed up deployment, i must have forgotten that my archers hit everything, at every inch of their range, on a 3+. 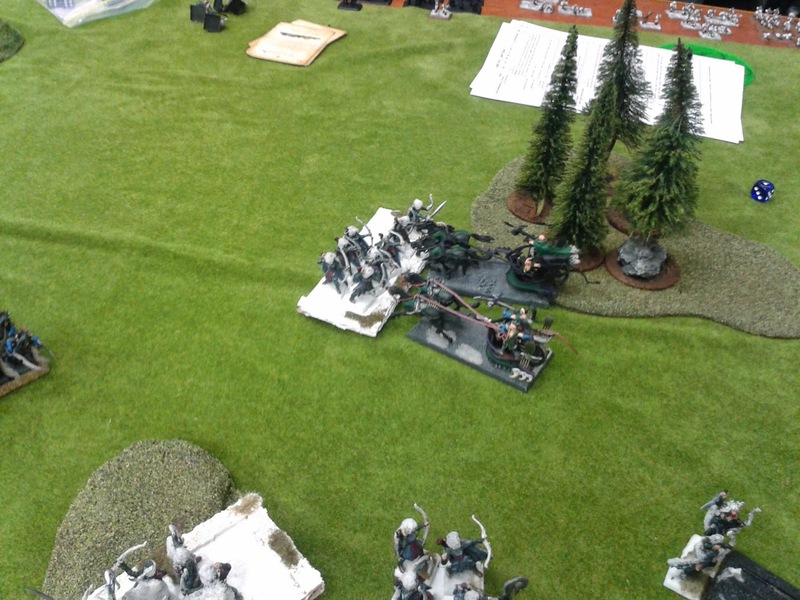 I deployed a fair few of them hard up against my deployment and this was my big mistake which probably lost me the game. Its good that i made this mistake now instead of during CTA as it would have cost me a game. 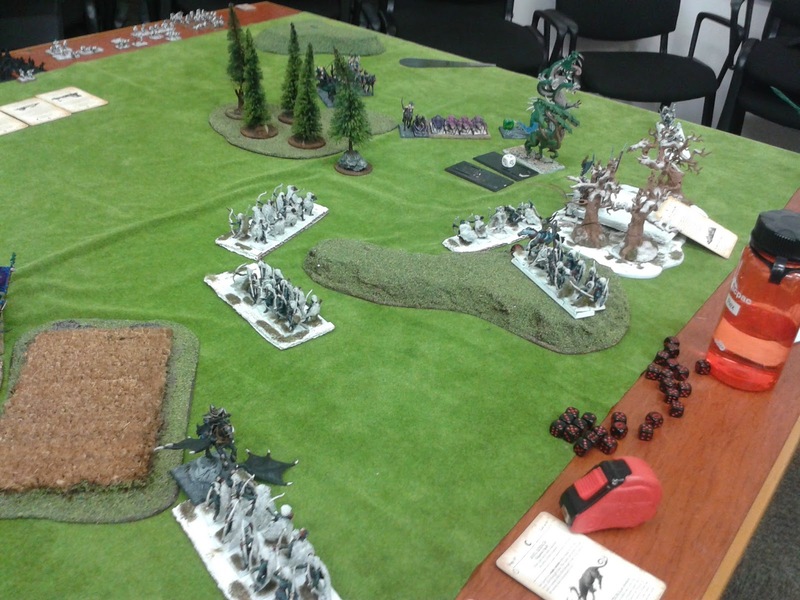 Anyway Nick won first turn and started with a general forward advance, with his Dark Riders and Shades dancing around my left flank, his monsters walked through ominously. In the magic phase Nick failed to cast his spell and so the magic phase ended. 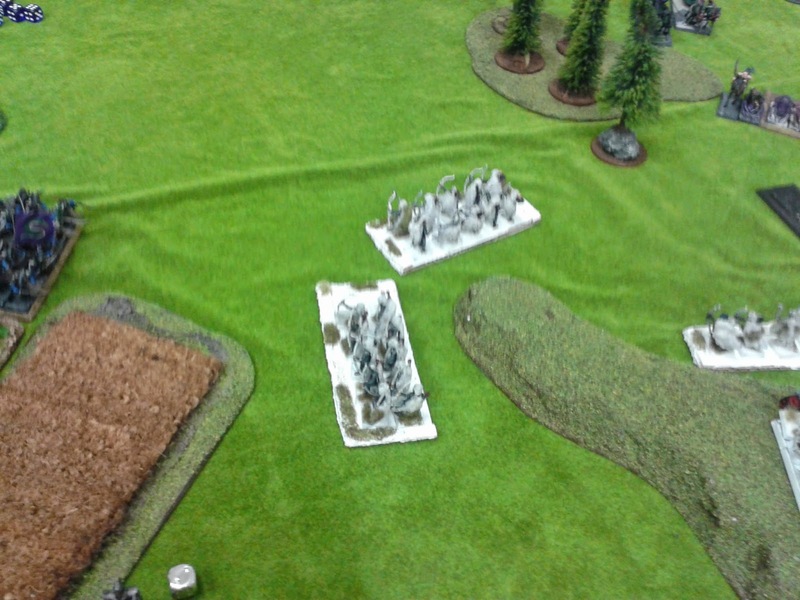 In his shooting phase he 2 hit my poor Treeman, killing him before he could kill a single Dark Elf (or Dark Elf pet monster), he also shot at the units on the left and inflicted some moderate damage. 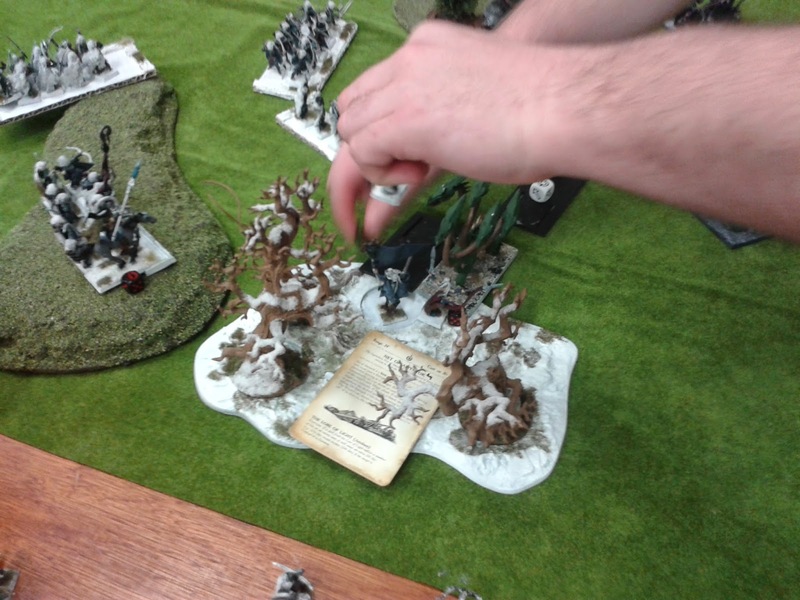 With the loss of my Treeman in the opening turn it was time for me to inflict some damage of my own. 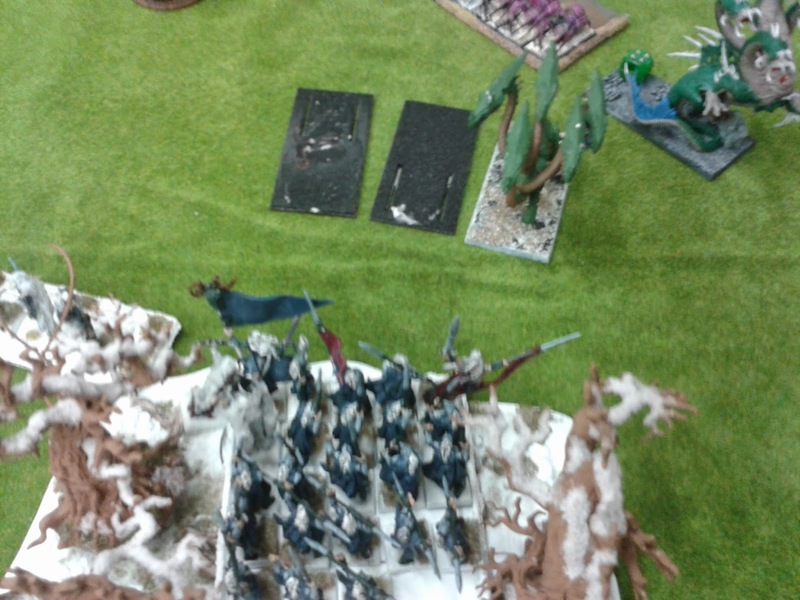 On the left my Glade Guard repositioned themselves to better shoot at the Dark Elf threat. 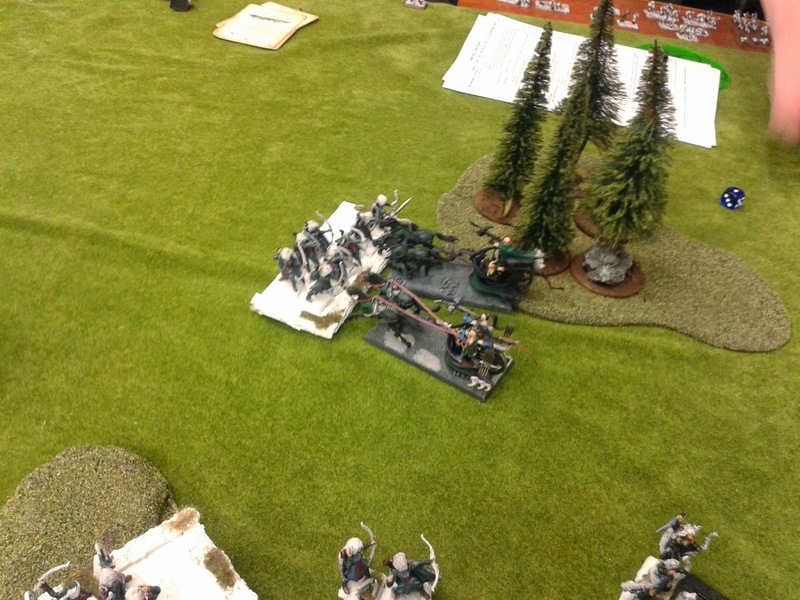 On the right my lines mainly held fast and aimed their weapons. 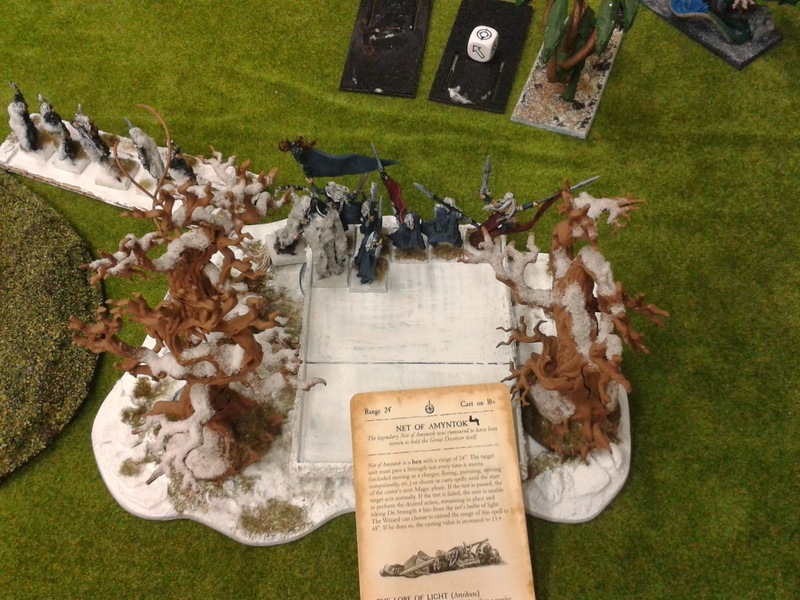 In the magic phase i arcanely unforged the BSB's Talisman of Protection (and inflicted a wound in the process). 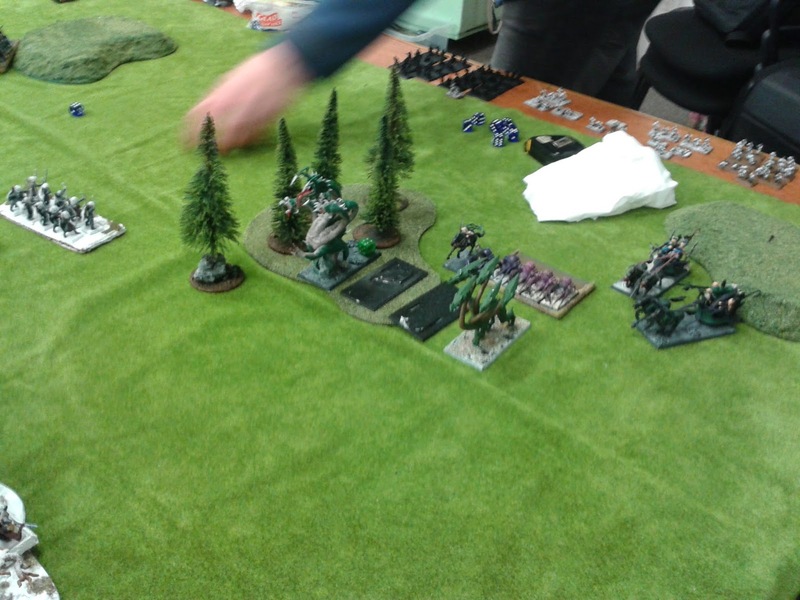 In the shooting phase i shredded his chaff (and vindicated my choice to pump this list full of Trueflight Glade Guard), at the end of the phase he had only a Dark Rider remaining (he started with 10 Dark Riders and 10 Shades). 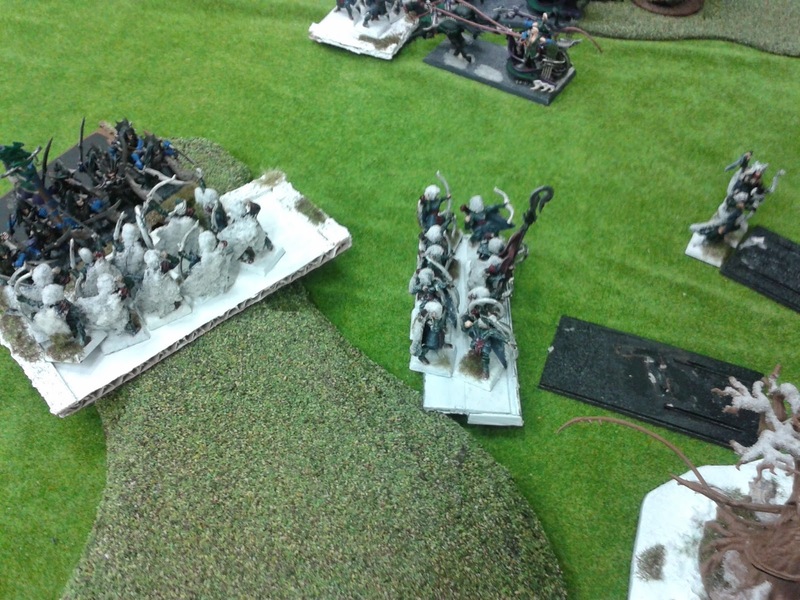 On the other flank i only knocked a wound off a Kharibdyss . 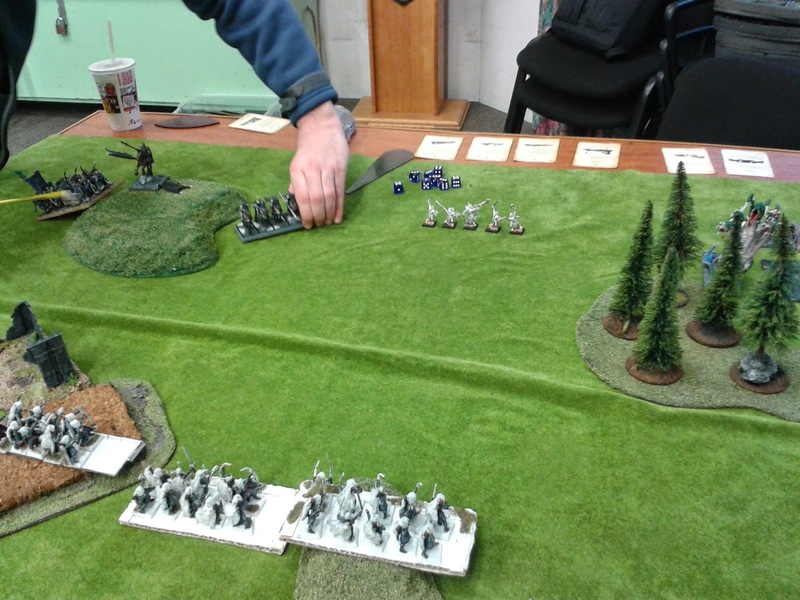 Nick opened turn 2 with his BSB flank charging a Glade Guard unit and the last Dark Rider front charging the same unit. 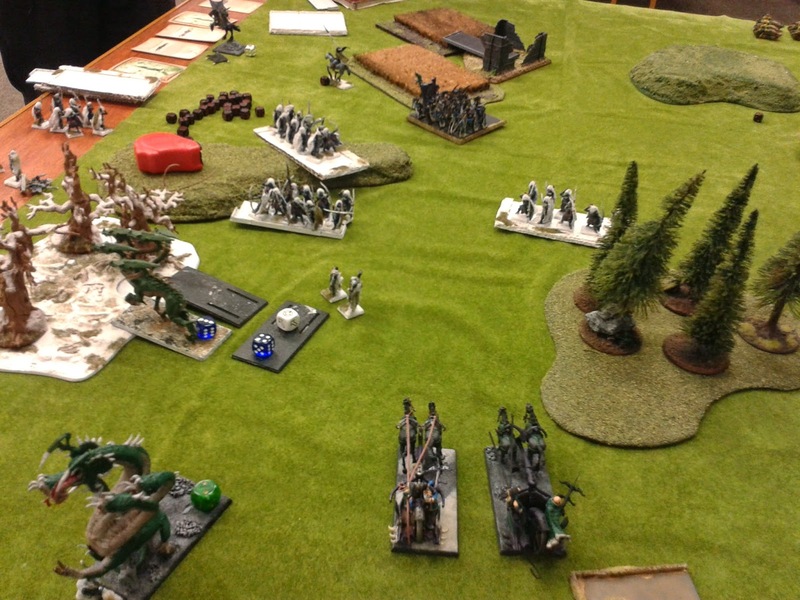 His Hydra's walked up in preparation for a Eternal Guard BBQ and the Kharibdyss went Waywatcher hunting. 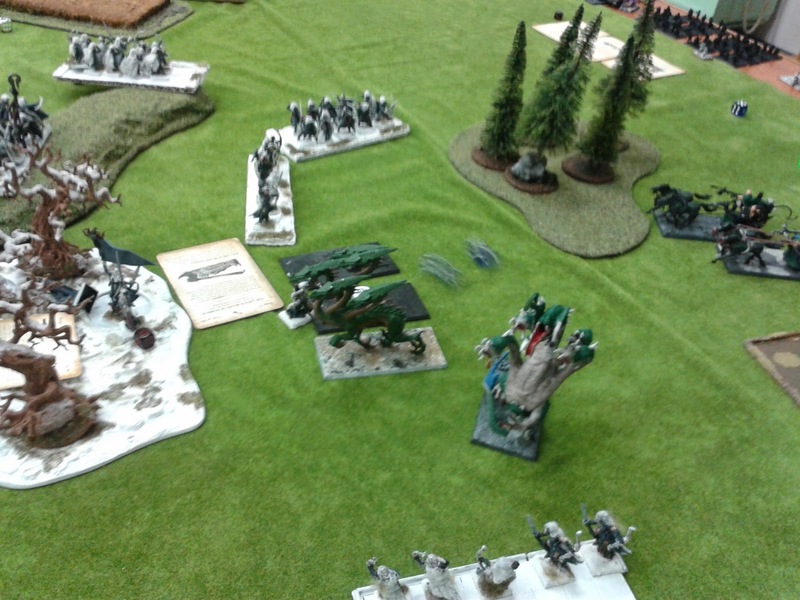 The remaining Dark Riders and mounted mage scooted behind the Wall-O-Hydras, on the right flank the Corsairs advanced and finally the chariots stumbled around a bit. 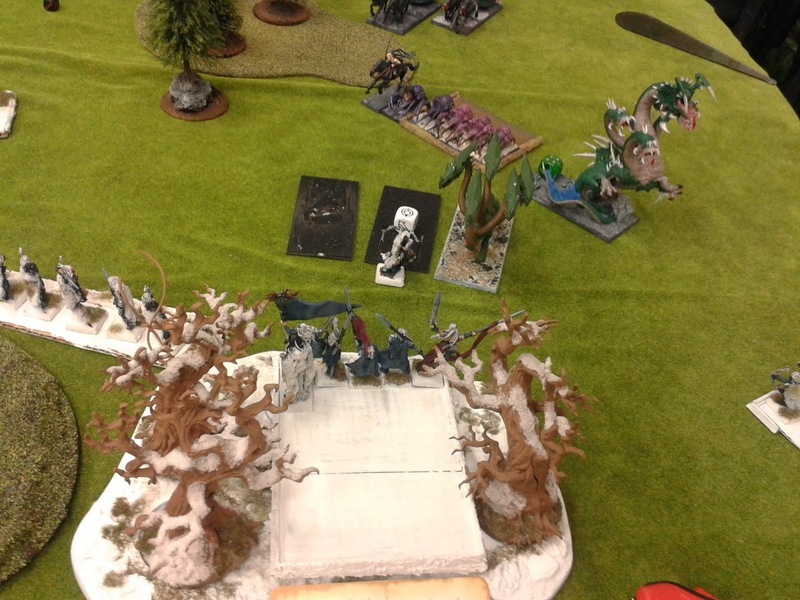 In the magic phase Nick cast the Net of Amyntok on my Eternal Guard (i underestimated the danger of that spell and let it through) and in the shooting phase Nick BBQed my Eternal Guard, out of 20 only 4 remained (and the characters). 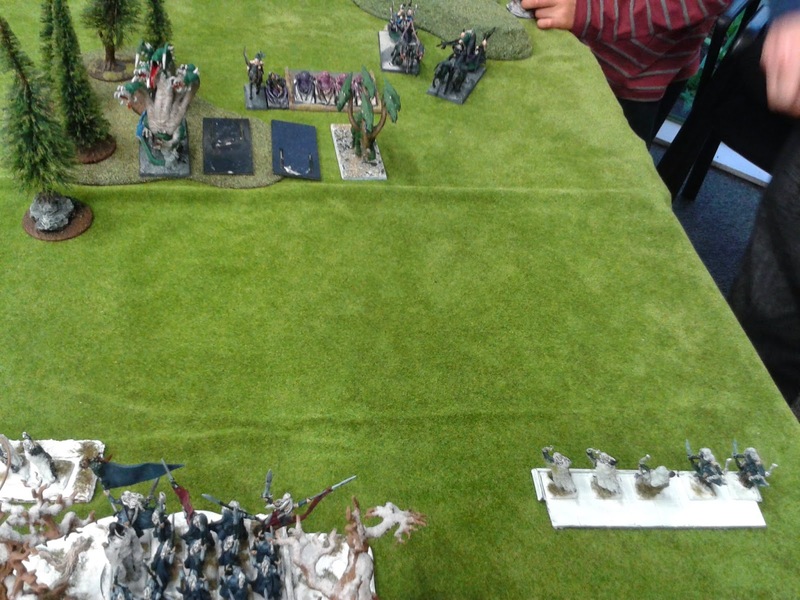 In the combat phase my Glade Guard killed the Dark Rider but were killed in turn by the BSB who overran into a unit of scouts. 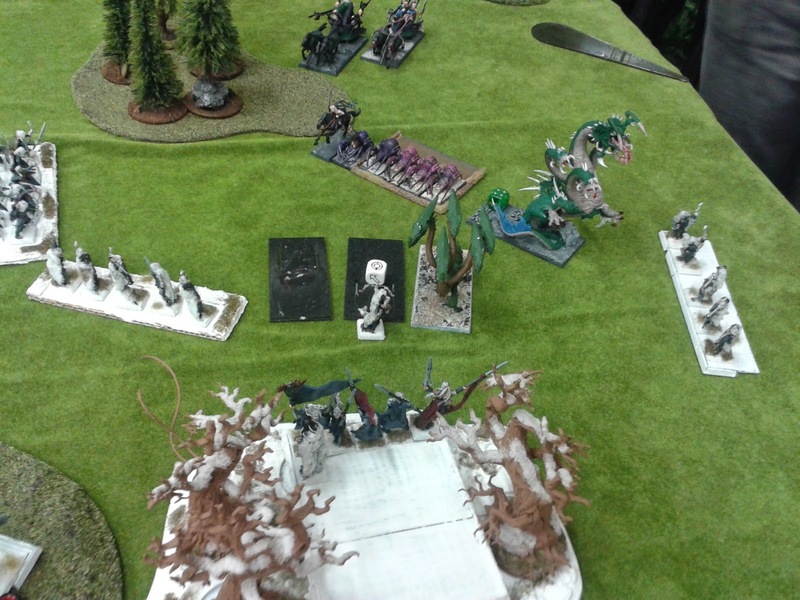 My turn 2 began with a failed (due to that damm net spell thing, which finished off the Eternal Guard) Shadowdancer charge which became a Waystalker charge into the only Hydra not to have flamed my Eternal Guard and was followed up with Glade Guard/Scout/Waywatcher dancing. 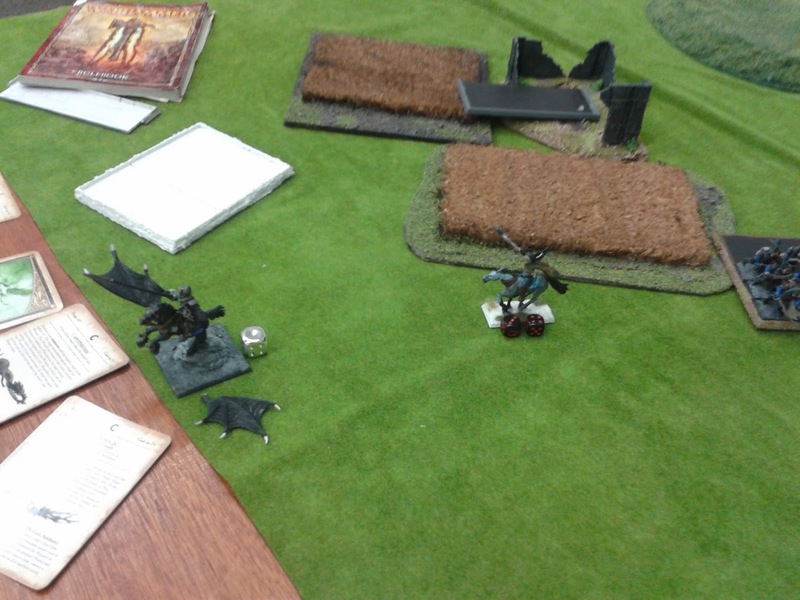 In the magic phase i cast Savage Beast on the Waystalker with the faint hope he would be able to slay the beasti. 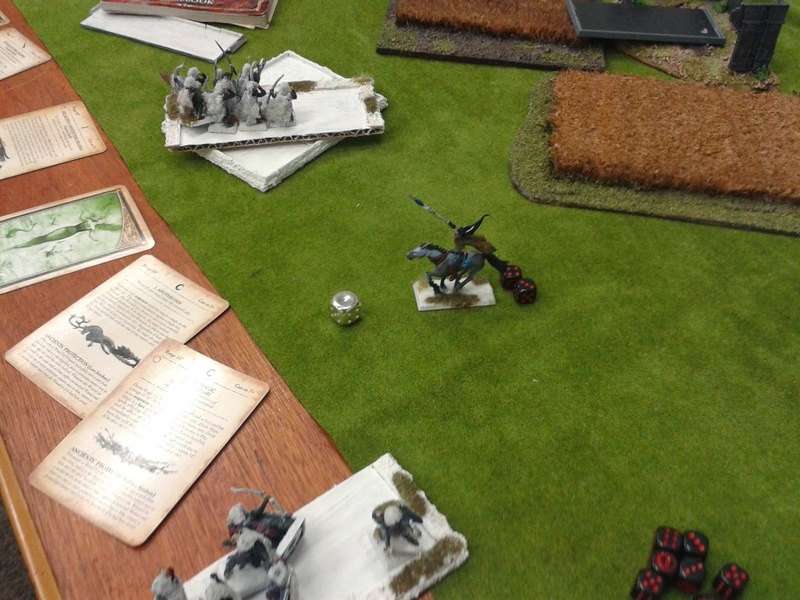 In the shooting phase the Net stuck again and prevent me from shooting the HODA (but did wound anyone else) but i was able wipe out Nicks remaining Dark Riders and mage in addition to knocking a few wounds off a assorted monsters. 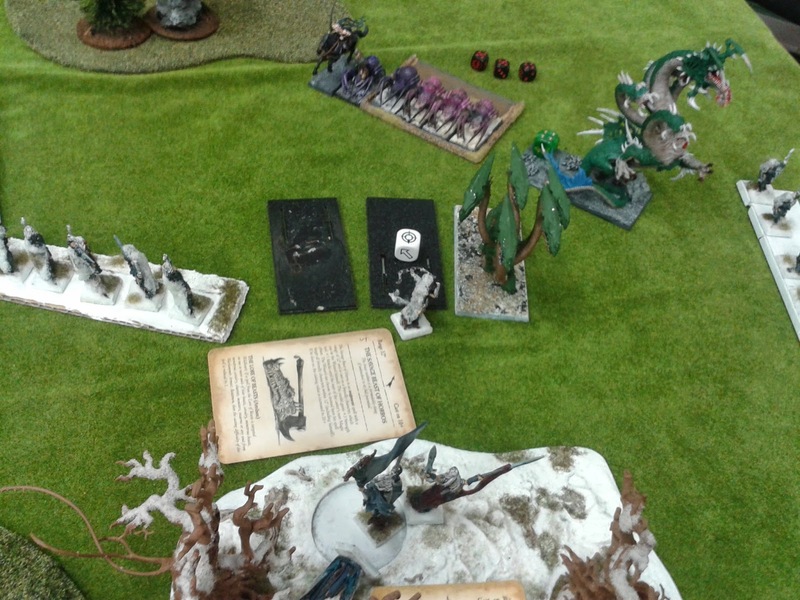 In the combat phase my Waystalker failed to kill the Hydra and was eaten and my Scouts were murdered my the BSB. 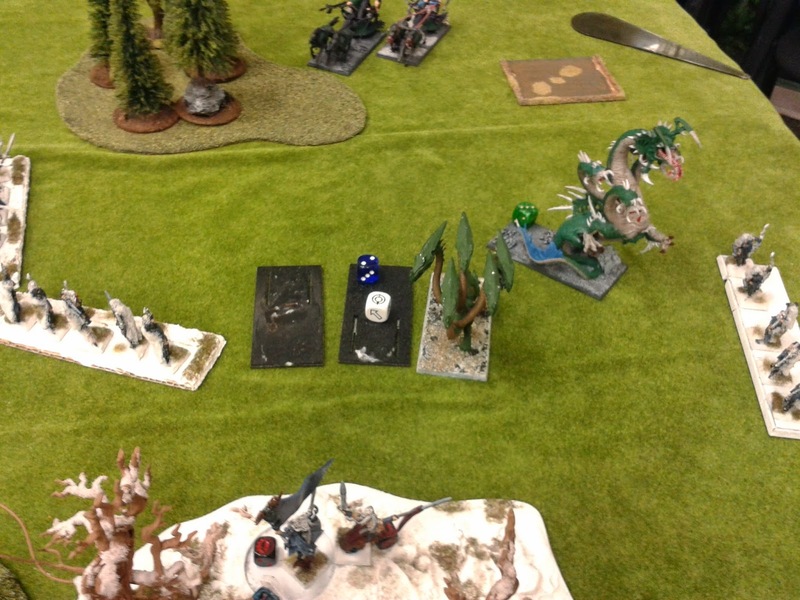 Turn 3 began with Nick charging 2 Hydras into my characters and a Kharibdyss into my Waywacthers. 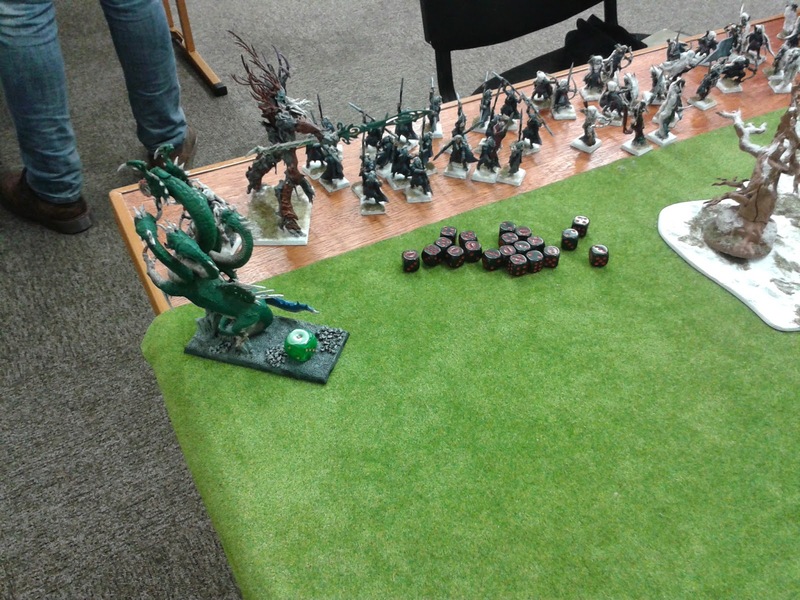 He then proceeded to move the Hydra who had not yet flamed onto my other Waywatcher units flank. 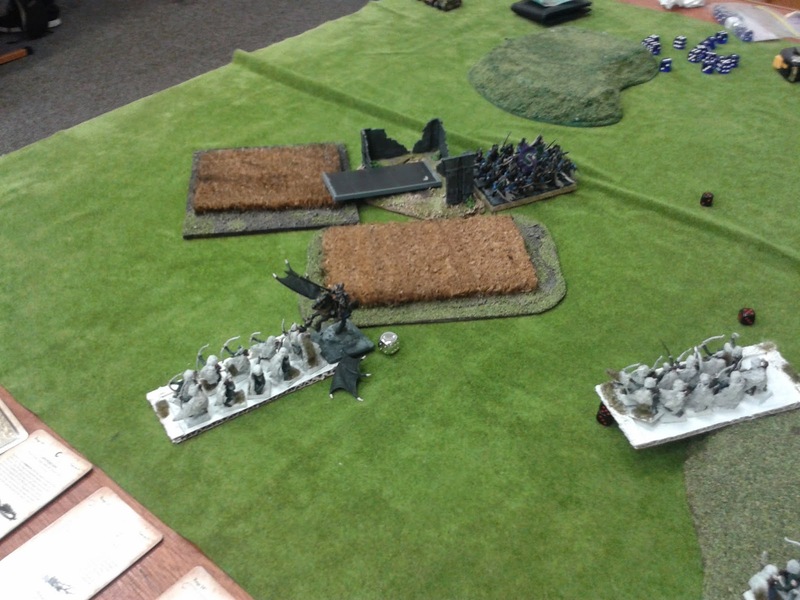 The chariots positioned themselves to fire at some scouts and the Corsairs advanced. 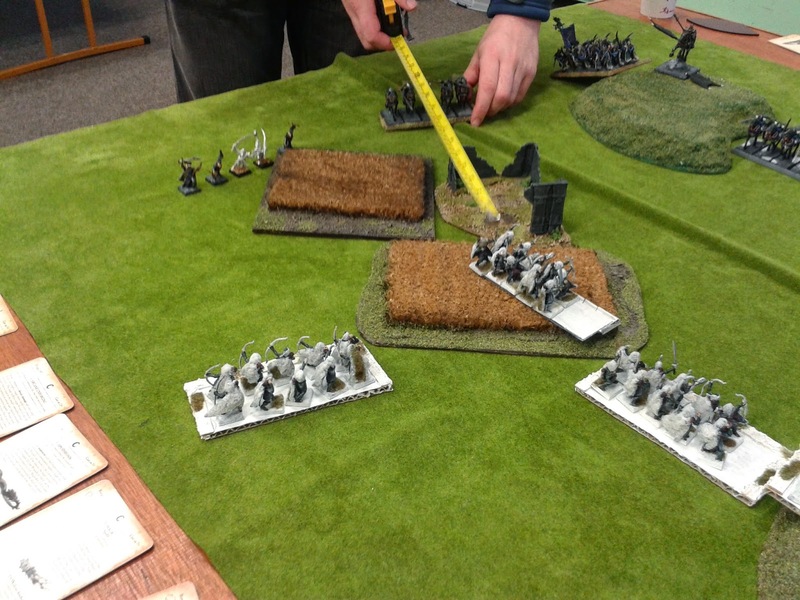 In the shooting phase the Waywatchers were BBQed down to two models(apparently crispy Wood Elf is a Dark Elf delicacy) and the Chariots fired ineffectively into the scouts. 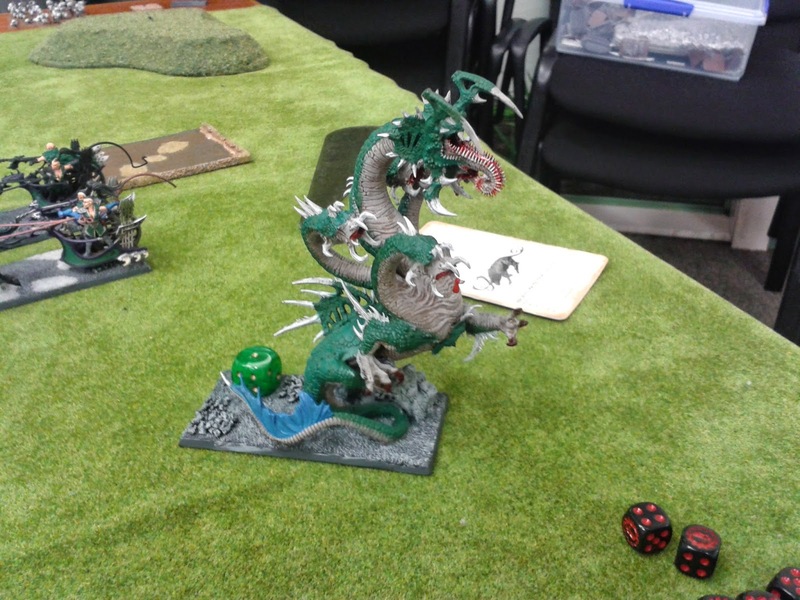 In the combat phase the Hydras slaughtered the characters but the Kharibdyss failed to kill the Waywacthers, reducing them to a single model who not only knocked a wound off the Kharibdyss but didn't run, way to go Waywatcher!! 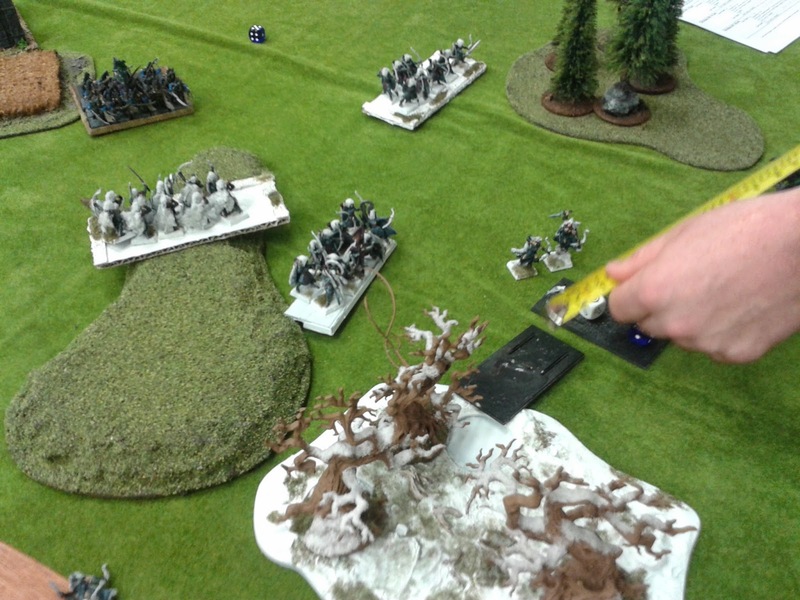 My turn 3 began with my mage jumping out of his unit and running around to face down the BSB (who had his back to him) in preparation to magically blast him. 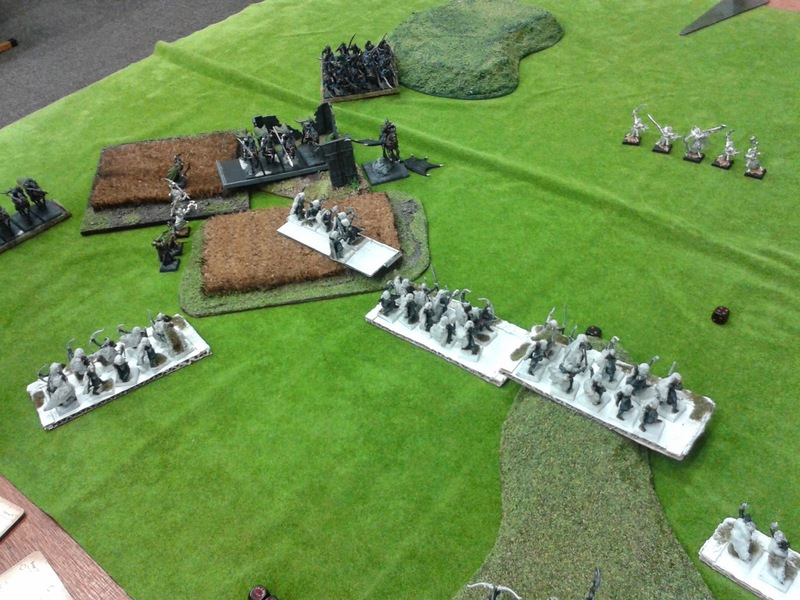 My Glade Guard general backed away from the closets targets they could see. 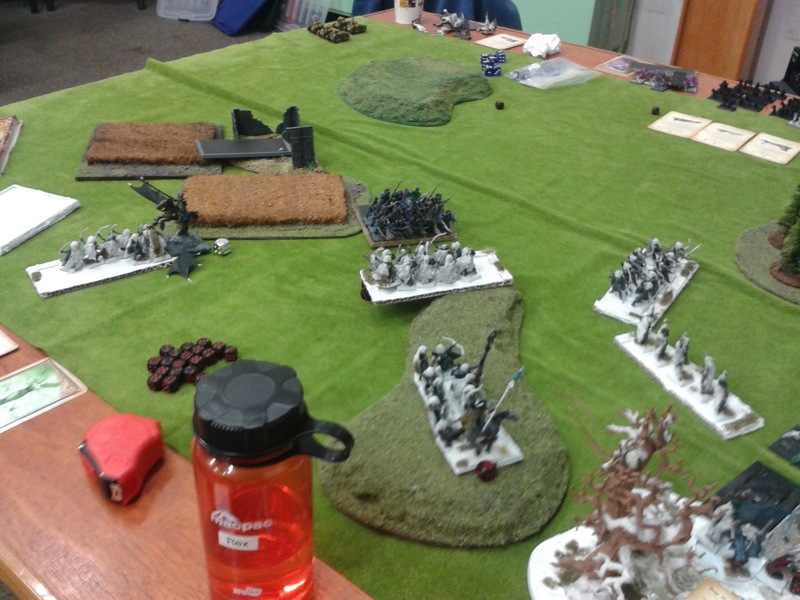 In the magic phase i hit the BSB with a 4d6 Soul Quench and knocked only a single wound off him and in the shooting phase i hit the corsairs a few more times and the other 2 Waywatchers failed to wound one of the Hydras. 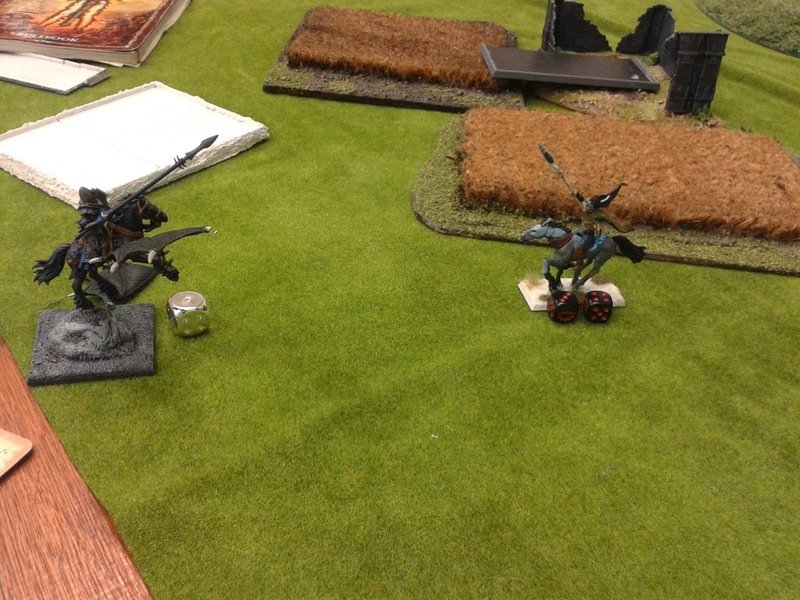 In the combat phase the last Waywatcher reduced the Kharibdyss to a single wound before being stomped on. 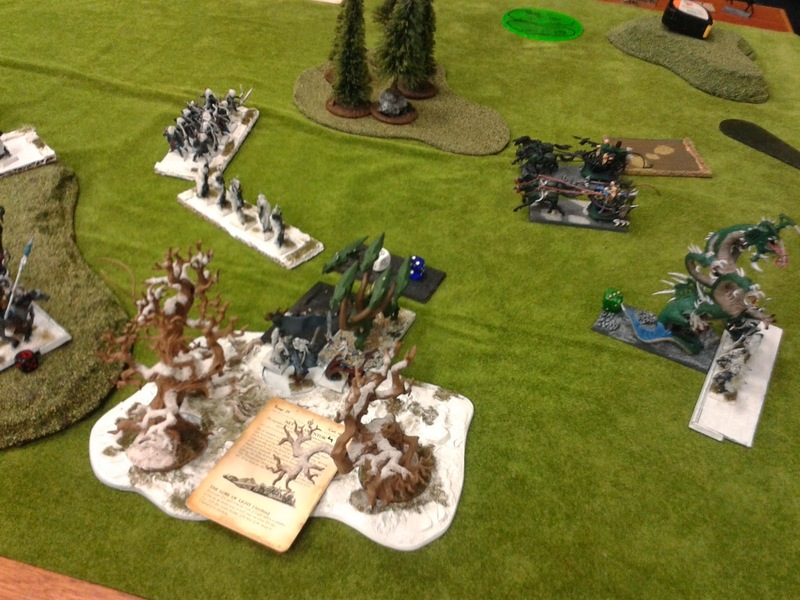 Turn 4 saw Nick charge both his chariots into my final scout unit, one of his Hydras into my last 2 Waywatchers and his Corsairs into one of my Glade Guard units. 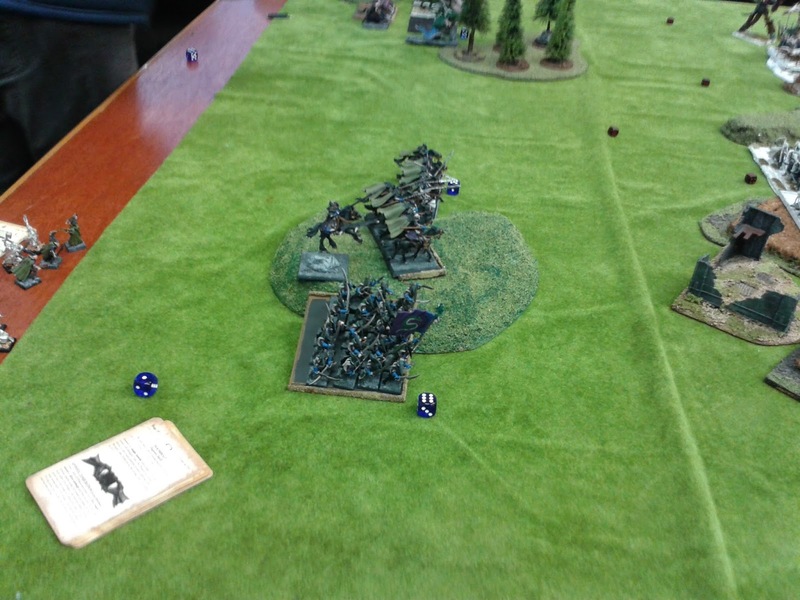 Also his BSB turned to face my mage with evil intent and his Kharibdyss fled into a corner. 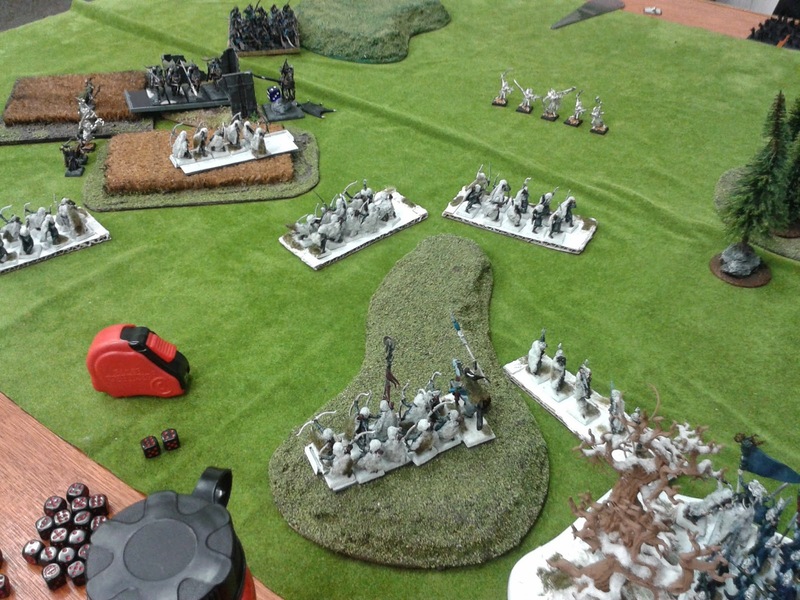 Skip straight to the combat phase and Nick killed every unit he charged, things were looking quite grim. 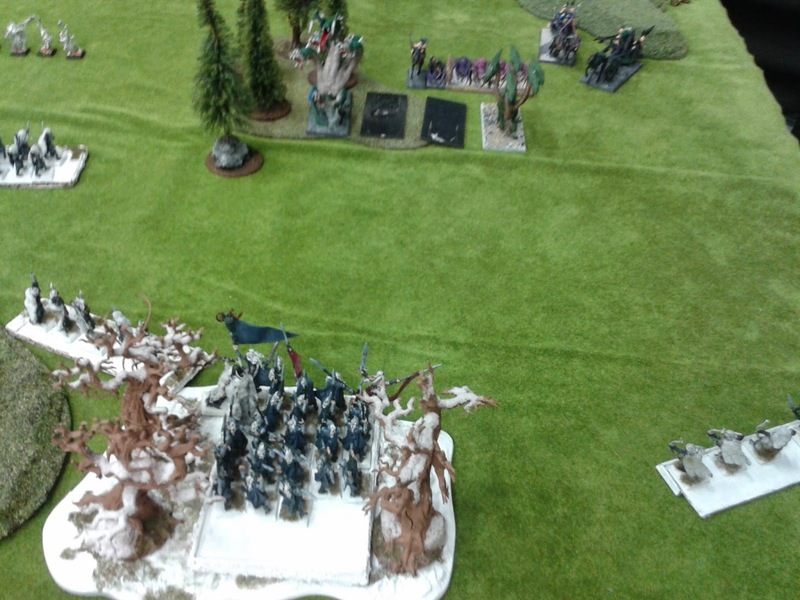 In what was to be my final turn i started by shuffling my last Glade Guard unit to the left in order to get a shot in on the Kharibdyss. 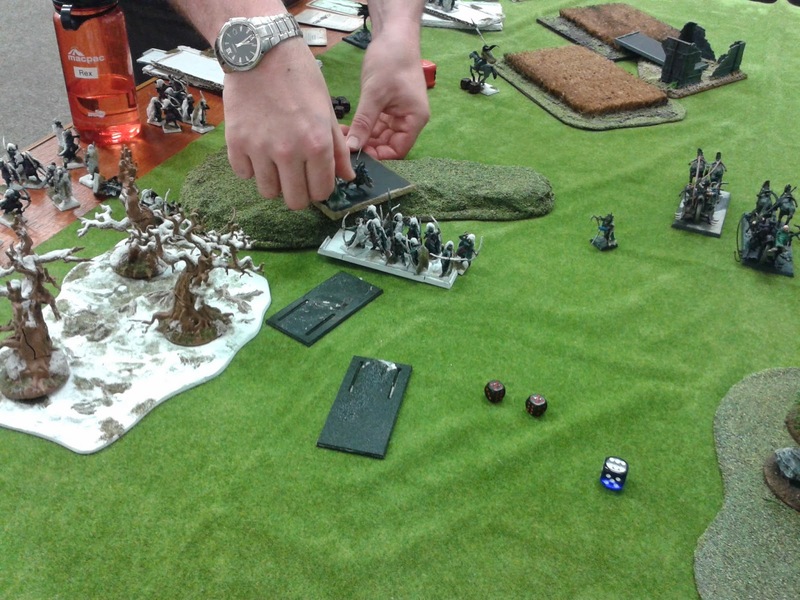 The magic phase saw me melt the BSB into a puddle with Arcane Unforging (love that spell) but unfortunately i failed to kill the Kharibdyss. 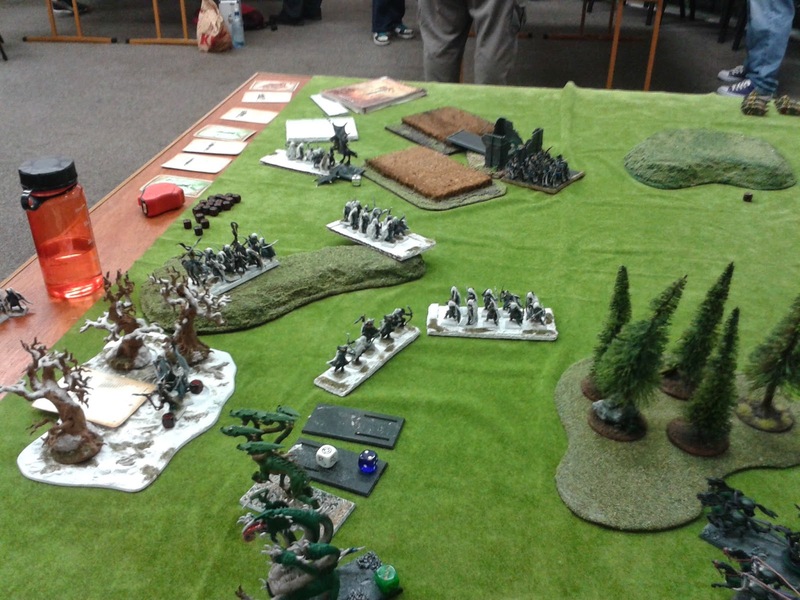 In the final movement phase of the game Nick charged my Glade Guard unit with the standard, who fled, were charged again only to flee again and get run down thus loosing me the game. 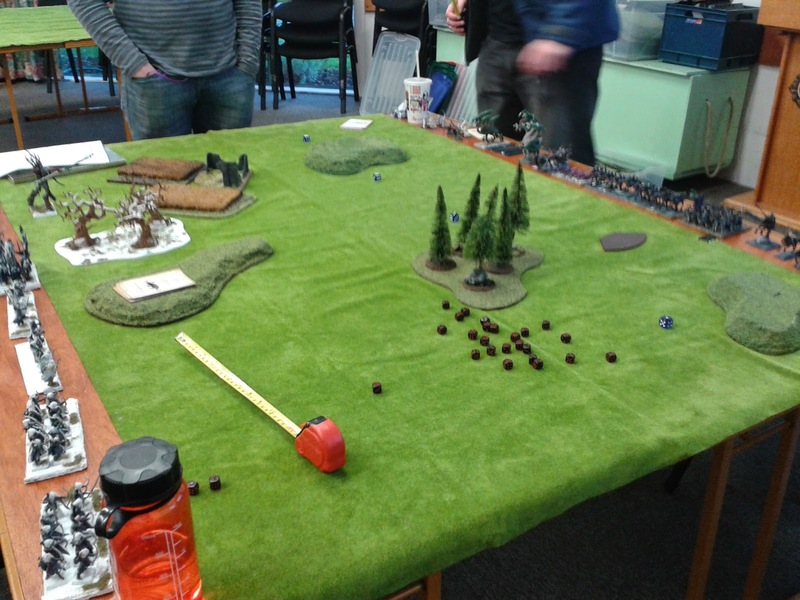 So what did i learn from this practise game? 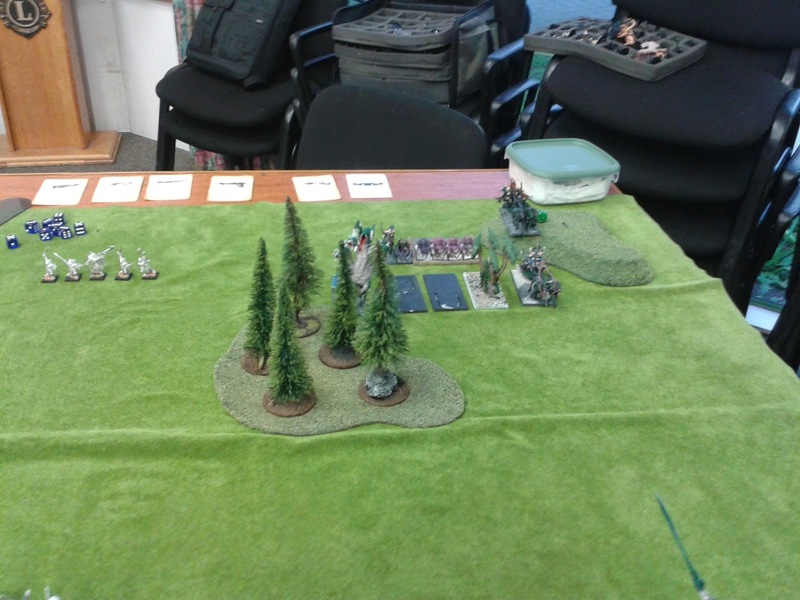 Well for one thing i need to plan the deployment phase. I can do fairly well in the other phases but the deployment phase is my weakest and i need to learn how to do it better as my poor performance in it looses me games. 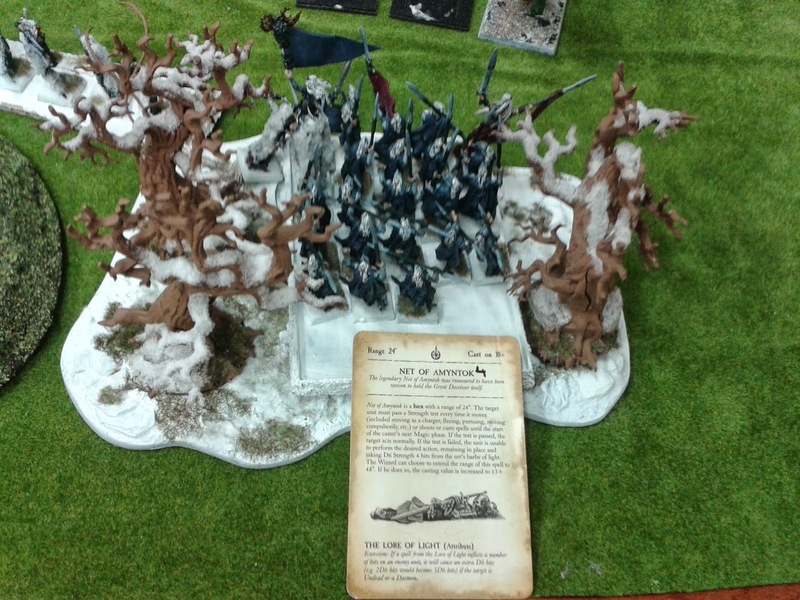 Also the Treeman is out of the list and a unit of 6 Treekin mainly because Treekin cant get 2 hit by bolt throwers, and with Wildform they can hit as hard (even better in some instances) as a Treeman. Time (and my game next Thursday) will tell if they are the better choice. Until next time. Can the Shadow Dancer take glittering scales with teh lvl1 upgrade? BRB states that wizards can only buy magical armour if they can also wear mundane armour...I dont think the Shadow Dancer has a mundane armour option. 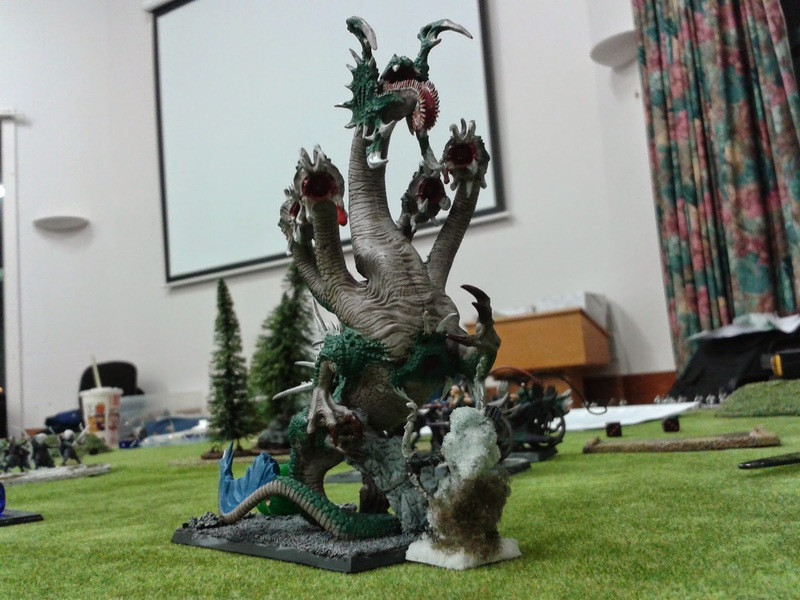 Slaughtermaster gets around it with an FAQ stating that an ironfist is armour for the purposes of allowing the purchase of magical armour. That didn't actually cross my mind, i guess he cant until a FAQ comes out saying he can (or cannot). In my copy of Wood Elves army book, Waystalker is listed as having 1A... What's the point of giving him the Bow of Loren? Or is his number of attacks FAQed somethere?